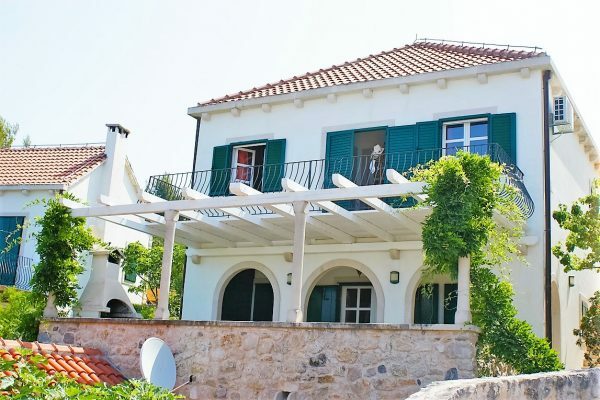 BR1304IV – A lovely stone house for sale Brac is a completely renovated and furnished property situated in the center of Sutivan, only about 30 meters from the crystal-clear sea. The four-level house has an interior surface of 130m2. The ground floor consists of a dining and kitchen area, one bathroom and a storage space. There is an interior staircase leading you up to the first floor where you can find a big living room and an excellent terrace of 40m2 with beautiful views of the sea, perfect for outdoor wining and dining. On the second floor you can find a bathroom and two bedrooms, and on the third floor of the house there is the master bedroom and the third bathroom. The house has a walled yard surrounding it, which is a great advantage enabling you to relax in complete peace and privacy while at the same time being right in the center of the village. The house for sale Brac was completely restored several years ago, and its traditional building, pleasant natural atmosphere and authenticity are very well preserved with lots of wood and stone details. All of these great features and the central location make this property an excellent buying opportunity and a great place to call your second home; you can also make it a business investment for making potentially excellent profit from renting. From here you have just about 8 kilometers to Supetar and the main ferry port on the island; from Supetar to Split you have less than an hour, which is another great advantage.